Note: This article is meant to be used as a guide to the first year of developmental milestones. Each baby is different, but if you’re concerned about your child’s development, please speak with a qualified pediatric professional. The health of your baby is important, and no one appreciates that more than you do. You may already have a pediatrician, but have you found a pediatric chiropractor yet? If you’ve ever had an adjustment, you may be wondering if chiropractic care is appropriate for babies, but doctors of chiropractic know how to properly adjust infants and children. In fact, a chiropractor adjusts a baby with about the same pressure that you may use to check the ripeness of a tomato. It’s very gentle, and we encourage you to hold your baby during the adjustment. There will be many milestones in your baby’s first year, including the first chiropractic adjustment. Let’s take a look at some first-year developmental milestones. After the first month, your baby may be able to lift his head briefly, make jerky movements, and move his head from side to side. At this age, he may begin to prefer the human face to other shapes. He will respond to loud sounds and blink at bright lights. In month 3, your baby may raise his head and chest when on his stomach, even lifting his head 45 degrees. He may kick his legs and reach for objects. He might also learn to hold his head up and open and shut his hands. By the end of month 4, a typical baby may sleep 6 hours each night (14-17 hours total). She might also learn to roll over and sit (with support). At this point, she can communicate fear, pain, and discomfort by crying. 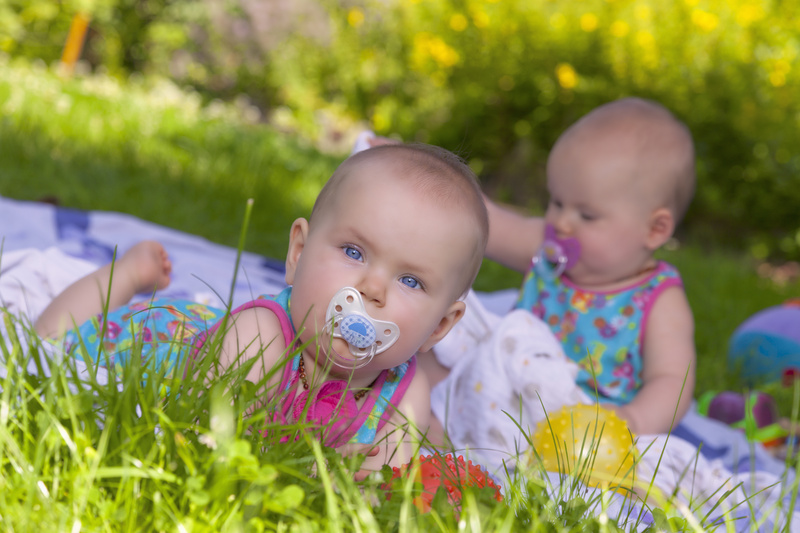 You may notice your baby amusing herself by babbling as she experiences new sounds. She will also be able to recognize a bottle or breast. After month 5, a baby will typically pay attention to small objects and begin to experiment with the concept of cause and effect. He will be able to see across a room and might “rake” objects toward himself with his hands. This is the age when teething usually begins. During the sixth month, your baby might learn to keep her head level, sit with minimal support, and grab objects. She might also be able to hold a bottle, open her mouth for a spoon, and copy some facial expressions. You might also notice her starting to make two-syllable sounds. In month 7, your baby will likely learn to self-feed some finger foods. He might also start playing peek-a-boo and imitating sounds. A baby at this age can typically distinguish emotions based on tone of voice and can turn in the direction of a voice. In month 8, a baby typically will turn her head away when finished eating. Babies at this age can roll all the way around, sit unsupported, and put themselves in crawling positions. She might chew on objects and reach for utensils when being fed. This is also the fun age when a baby will start to test gravity by dropping objects from the high chair. She will also be able to respond to her own name and will have different reactions to different people. By the end of month 9, a baby usually reaches for toys, drops objects and then looks for them, and can get into a sitting position by himself. He might also begin to identify his own reflection. During the tenth month, your baby might transfer objects from hand to hand. She might also be able to pull herself up to a standing position and stand while holding onto someone or something. By the end of month 11, your baby may start to say “mama” and “dada” discriminately. He will likely understand the word “no” and start waving when someone leaves. This is the age when many babies learn to clap their hands. After month 12, your baby will likely be triple her birth weight. She could also learn to walk with help, dance to music, understand simple commands, and test parental responses to certain behaviors. Babies at 12 months old usually become more interested in books. As you can see, the first year of a child’s life are full of wonderful personal milestones, and you’ll find yourself celebrating achievements like sitting up, standing, and first words. Throughout the year, some of those milestones might mean stumbling, tripping, and falling. Your baby may also experience colic, which chiropractic has shown to relieve in many infants. Infant adjustments are very gentle. Here at Batson Chiropractic Group, we adjust babies often and know exactly how to treat an infant as young as a couple of weeks old. In fact, we offer free “first-after-birth” adjustments for the newborns (0-2 years old) of our practice members, and we would love the opportunity to help your child. Call (615) 751-0958 today to schedule your baby’s visit with one of our 5 chiropractors!